On May 9, pro-Russian separatists in eastern Ukraine unveiled a range of locally-produced weapons systems. The announcement correlated with Victory Day, which is widely celebrated military holiday in Russia and commemorates the victory over Nazi Germany in World War II. These systems included two mobile rocket artillery systems, which would ostensibly fall under the command of the newly-created Tactical Rocket Troops (RVTN). While there is virtually no information about the RVTN, including whether it has troops, the hardware they would use, and the entities that produced them were fairly well documented. The so-called “Military-Industrial Complex” of the self-proclaimed “Donetsk People’s Republic” (DNR) is responsible for a great deal of the serial arms production for pro-Russian separatists in Donetsk. The @DFRLab previously reported on the “Military-Industrial Complex” of the DNR last month, covering some of the weapons they manufactured, noting that while many of the arms were rudimentary, the capability for producing more complex firearms was real. Now, with the unveil on May 9, the scale and range of production is becoming more apparent. In terms of organization, the “Military-Industrial Complex” falls under an entity called the “State Innovation Company” (GIK), which is a separatist organization that appropriates factories in areas under their control and operates them for various purposes. On May 9, GIK held a public military exhibition through its “Military-Industrial Complex” brand in which two mobile rocket launch systems were displayed — the “Snezhinka” (snowflake) and “Cheburashka” (a reference to a popular Soviet animated character). Prior to the Victory Day announcement, however, open source evidence of local separatist rocket artillery production was already available. Interestingly, the model recorded by Ukrainians on the receiving end was neither “Snezhinka” nor “Cheburashka”, but a third type which was not presented at the May 9 exhibition. This model of rocket bore a strong resemblance to the Improvised Rocket Assisted Munitions (IRAM) used in the conflict in Syria. This refers to a relatively small rocket motor to propel a large warhead. 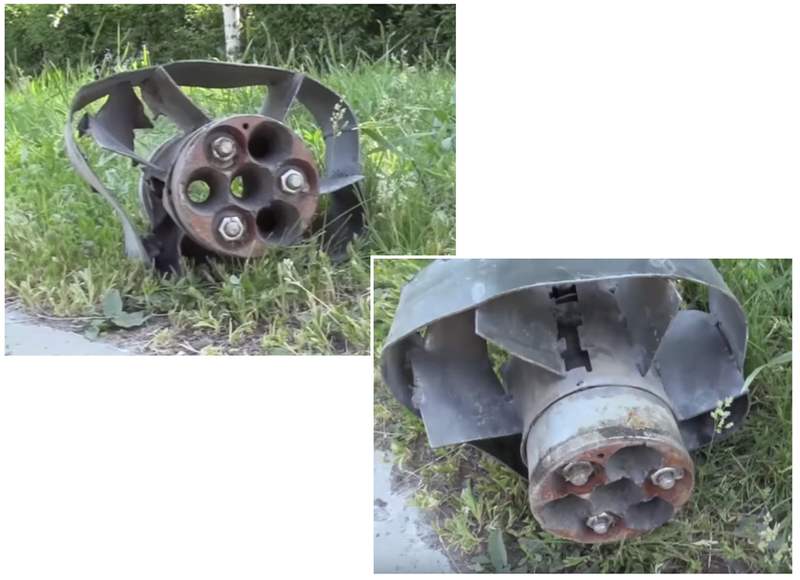 The first recorded incident of this type of munition being used was from May 28, 2017, when Azov media released a video of the aftermath of a separatist rocket attack against the town of Krasnohorivka. The video briefly records the rear section of what is now known as “Kitaets” (Китаец — “the Chinese”). As opposed to the “Snezhinka” and “Cheburashka”, which are fired off launch systems on trucks, the “Kitaets” is fired independently from a single “rail” propped up in a similar manner to a mortar tube. 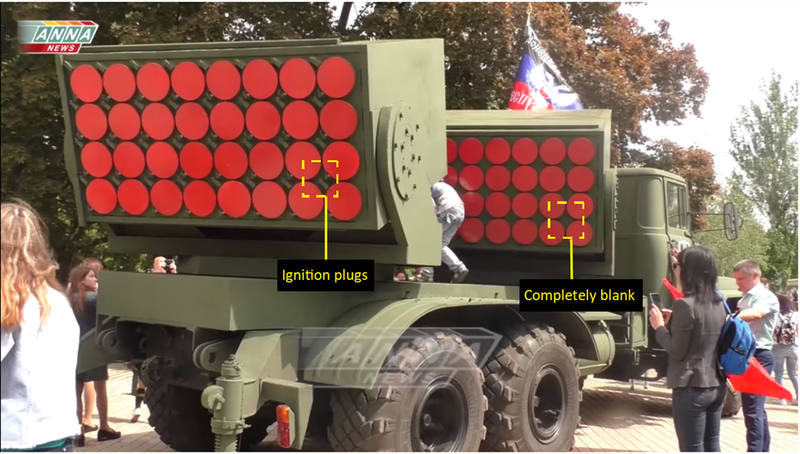 The video showed, if only briefly, a heavily modified nozzle section of what appeared to be a 9M22U 122mm artillery rocket from the BM-21 Grad multiple launch rocket system. Three of the six outer nozzles had been filled in and and appear to be fastened to something with nuts and bolts, although it is unclear at this time what purpose this may have served. This nozzle section bears some resemblance to the improvised rockets employed by the Syrian government, which also relied on BM-21 rockets. However, where the Syrian government would build tubes to insert the 9M22U engines into, the separatists had built the rest of the rocket (the fins, etc.) directly onto the 122mm rocket engine, which itself was modified internally. Nozzle section comparison. Left: 9M22U (Source: Wikimedia Commons). Right: Kitaets nozzle section (Source: AZOV Media / YouTube). The above image is an illustration of the notable similarities between BM-21 rockets and the rocket debris found in Krasnohorivka. The notable difference here is the augmented tail system, which, due to a change in launch system, had to be changed from the original spring loaded fins to less advanced static fins. This incident was the first documented employment of this type of rockets in separatist-held eastern Ukraine, and more imagery did not surface for a few weeks. On April 24, 2018, instagram user bring_me_the_swampy posted an image of the warhead of “Kitaets”. Swampy, an experienced British Explosive Ordnance Disposal (EOD) technician in the Mariupol area, was puzzled by the device which hadn’t been spotted in the area before. One thing did stand out as familiar, at the tip was an MRV-U Point Detonation (PD) fuze, native to the warheads attached to the 9M22U. It is now clear that separatists have relied heavily on existing BM-21 rocket parts in the design of its locally produced artillery rockets. The BM-21 has seen extensive use in eastern Ukraine, and it is unclear whether these rockets have been built from cannibalized munitions, or salvaged from duds and fragments. More recently, on May 10, Ukrainian Channel 24 ran a story on “Pro-Russian Separatists Shelling with Unknown Weapons”, which showed detailed imagery of what they revealed to be nicknamed “Kitaets”. The video footage revealed for the first time a full view of the entire rocket, but this time with a different nozzle. While the combustion chamber and fin assembly still appeared to be the same kind of modified 9M22U type as from 2017, the nozzle section itself was vastly different, featuring 18 small nozzles lining the edge of the block. The above illustration is an approximate reconstruction of how “Kitaets” has evolved since this time last year. While BM-21 components still remain central to the design of the rocket, an augmentation is apparent. The following day, on May 11, two videos of relating to this topic emerged, one by DNR’s so-called Ministry of Information, and another by Zakhar Prilepin, a well-known National Bolshevik (Nazbol) novelist turned deputy commander of a DNR battalion. Beginning with the latter, Prilepin’s video showed footage exclusively of “Kitaets”. This video was helpful in understanding two things — how the rocket is fired, and that the most recently spotted nozzle block is likely either the same one in the Ukrainian video, or part of a larger serial production of custom produced rocket engine components. The above image illustrates the frame from which the rocket is fired: a simple setup with a bipod that can adjust for elevation, determining the angle and distance at which the rocket travels. The other video, by the DNR “Ministry of Information”, included footage of this rocket along with the Snezhinka, Cheburashka, and a fourth unknown rocket. This video did include launch footage of the “Kitaets”, but no significantly new information about this rocket was included. The Cheburashka is a road-mobile multiple launch rocket artillery system that fires 217mm rockets off the back of a modified KrAZ 260 chassis. Not nearly as much is known about the Cheburashka as the “Kitaets”, but the May 9 and 11 videos are helpful in drawing a couple of conclusions about the system. For example, the informational chart at the expo claimed that Cheburashka could fire 64 rounds in total. While this was technically true, it was only because the system carried two clusters of rockets: one as a launcher, and the other storage. Each cluster of the exhibition model held 32 rockets each at a eight-by-four rocket pattern. We could deduce this by looking at the rear of each cluster, where a definite difference immediately became apparent. The rear cluster clearly had plugs leading to the rockets along with a locking mechanism to keep the rockets in place, while the forward cluster was completely blank, suggesting that it was for storage only. Footage of the Cheburashka projectile at the expo, along with footage of the Cheburashka firing in the May 11 video, provided further insight into the design of the rocket. Later footage released in June revealed that other Cheburashka launchers were capable of launching from both clusters. The Cheburashka rocket bears a strong resemblance to earlier types of Soviet large-caliber, short-range rocket artillery; specific designs that come to mind are the M-14 and M-24 artillery rockets. Beyond the obvious similarity of shape and size, the way that the exhaust flames seemed to emanate from the rim of the rocket was consistent with the nozzle designs of these systems. This design is also highly similar to the updated nozzle block of the “Kitaets”, with multiple smaller nozzles lining the rim, which share a common combustion chamber. The May 11 video also showed that the Cheburashka is fired from outside the vehicle, via a wire leading to the rear rocket cluster, pictured in the middle image in the above graphic. This is not common for this type of vehicle, and suggests that the Cheburashka is still in its prototype stage, with the operator staying at a safe distance in case of catastrophic failure. Another interesting feature was the non-descript nature of the fuze on the Cheburashka rocket. @DFRLab looked through databases of Soviet-era fuzes and was unable to find a positive match to the one put on display on May 9. The other rocket system on display on May 9 was introduced as the “Snowflake” (snezhinka — снежинка). The Snezhinka fires two unguided 324mm rockets from the bed of a KrAZ 260 truck. Similarly to the Cheburashka, little is known about the internal workings of the Snezhinka, but it is likely to be very simple. Looking at the DNR “Ministry of Information” May 11 video, we see three useful examples of the Snezhinka in flight. In two examples, three jets were visible, but in the third example, only two were visible. To explain this, the above graphic shows the rocket in flight, with a visualization of how the nozzles are oriented in relation to the camera, concluding that the Snezhinka likely has four larger nozzles. This is rather different from the previous two rockets, but most likely all four rockets still share a single combustion chamber. The Snezhinka did, however, appear to use the same type of non-descript fuze as the Cheburashka. After the May 11 video, Twitter user Glasnost Gone posted a geolocation of a firing positions for one of the rocket launches, which was fewer than five miles from the line of contact. The caliber of all of these systems far exceed that allowed under the Minsk agreements near the contact line. The Snezhinka, in particular, is over three times the allowed caliber of 100mm near the contact line, totaling 324mm. The video also included footage supposedly depicting these rockets employed against Ukrainian government positions, including one video showing three impacts near a government position outside Kominternove, a town near the coastal city of Mariupol. Looking at recent footage relating to the DNR Tactical Rocket Troops, the @DFRLab found no evidence that this military group is truly operating as a military unit. In footage from May 9, the only evidence that the RVTN may exist as a unit was a flag draped over the hoods of the two KrAZ 260 rocket trucks. Instead, the expo was filled with armed men in “Military-Industrial Complex” uniforms. This was an odd detail because there’s no real explanation for why employees of a weapons factory would pull security duty. Moreover, the uniformed men had no actual custom nametags, but instead tabs that read the generic term “staff member” (сотрудник) on their left chest (pictured below, right). In the Ministry of Information May 11 video, there was no evidence of the RVTN being an actual, oeprating military group with documented activities. Instead, the rockets were operated by GIK staff, as illustrated above. In addition to GIK staff, and a number of unidentified individuals, some familiar faces consistently showed up in the Ministry of Information May 11 video, and others relating to the rockets, namely Zakhar Prilepin and Alexander “Tashkent” Timofeyev. Timofeyev (pictured above) is the so-called Minister of Income and Taxation of the DNR, but appears to be heavily involved with the production and testing process of these rockets, as well as other aspects of the DNR “Military-Industrial Complex”. We first saw Timofeyev in the context of the “Military-Industrial Complex” with the video on the separatist-produced handgun, “Oplot”. Since then, he has appeared in nearly every video in relation to the military aspects of GIK, including three separate occasions in the May 11 video. Also briefly visible in the Oplot video was Artem Vovk, head of the GIK, during the part of the segment where they visited the factory at which the pistols were produced. Vovk has not been spotted in any videos relating to the DNR “Military-Industrial Complex” since this appearance and, apparently, keeps a fairly low profile. Nonetheless, Vovk was recently named in a “decree” [.pdf] by “Head of the Republic” Alexander Zakharchenko, in which two factories were put under GIK’s control via the “Military-Industrial Complex”. The decree, on the expansion of the DNR “Defense-Industrial Complex”, placed “Donetskgormash” and the Horlivka Machine Building Plant under the control of GIK. The decree was dated September 1, 2017, meaning that likely prototype stages of the Kitaets were produced elsewhere than these two plants. However, it is highly likely that the Cheburashka and Snezhinka were built in these locations. Locally-made rockets in separatist-held Ukraine are certainly real and worthy of attention, but rely on parts from Russian-made rockets to function and are not exemplars of true innovation. While there is evidence of these rockets, which far exceed the caliber allowed under Minsk agreements, being used against Ukrainian government military and civilian positions, at least two have failed to detonate. So far, open source evidence has only emerged showing the Kitaets being used for fire missions against government-held areas. RVTN does not yet seem to have materialized, and it is unclear whether it will, or how this would happen. All activity surrounding these rockets is still associated with GIK’s “military-industrial complex” and Timofeyev, who is likely funding the initiative. The people involved with the actual production of these systems remain out of public view. Overall, the entire premise of having a tactical missile troop seems a to be more for show than for actual deployment, barring a situation in which the DNR is able to produce a significant stock of high-caliber rockets, especially since they already have a sizable inventory of artillery systems gifted to them by Ukraine’s eastern neighbor. The @DFRLab will continue to monitor this topic under our #MinskMonitor series. Michael Sheldon is an Digital Forensic Research Associate at the Atlantic Council’s Digital Forensic Research Lab (@DFRLab).